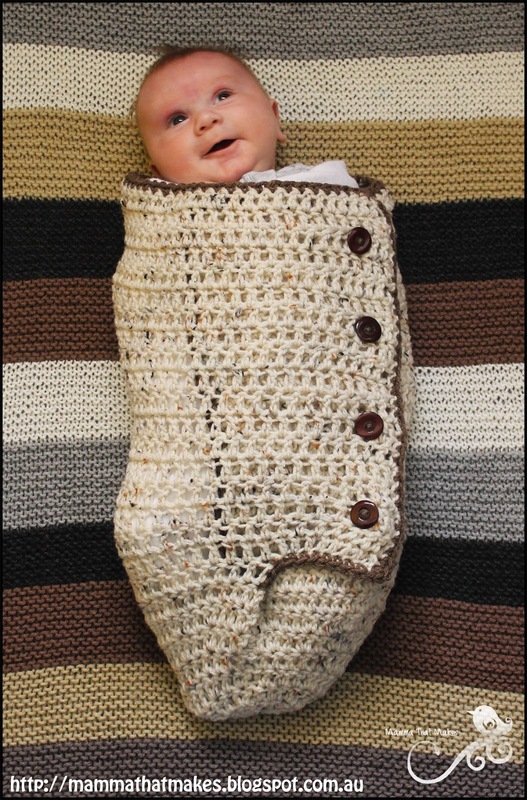 Ever since the release of the Snuggle cuddle cocoon back in 2012 people have asked for a newborn size. I am pleased to say that I now have instructions on how to make it to fit newborns, and 0-3 months. Jackson is 2 months old in the images (11 pound, 59cm long), so you can see how it fits. If you have a long bubba just add some more rows. This cocoon used the best part of a 140g ball of Red Heart super saver, which is 260yards/238meters so make sure you have enough yarn. As you can see, I also have some lovely worsted weight yarns now, so I can go ahead and make some wonderful patterns with them. Very exciting stuff indeed! The flap on the cocoon in the image is backwards. Somehow my baby brain managed to turn the thing in the wrong way. Your cocoon will have a flap facing the opposite direction, unless you actually want it to face this way and in that case just turn the piece inside out :) I'll get new photos when I have a chance to remake the cocoon. Worsted Weight/10ply yarn I used Red Heart Super Saver in aran fleck for the main colour and Bernat super value in brown for contrasting. Joins are made to the first stitch, not the chains. 8. Ch3, dc in each stitch around, do not join. From here on we will be working in rows. 10- 26. Ch3, turn, dc in each dc across. End main colour. Change to contrasting colour and sc across, then sc evenly down the opening and back up the other side. Sew on buttons and weave in all tails. hi...awsome pattern.do u have video for the same? I just made this for my soon-to-be-niece! Your pattern was super easy to follow and it looks awesome! Thank you so much! I do have one question about the buttons: do you sew them onto the top flap, on the bottom flap where they get pushed through the DC spaces, or sew through the top and bottom flaps sealing it together? Thank you! Im glad you like the pattern. I sew them on the bottom flap, and push them through the dc's as "buttonholes" Doing it this way makes it more adjustable depending on bubs size. The chain 10 is the start of the flap. If you turn the right direction and double crochet in the 3rd chain from the hook, you should have about 5 double crochets that line up with the row to continue "then each dc across." There are no buttonholes in the pattern. 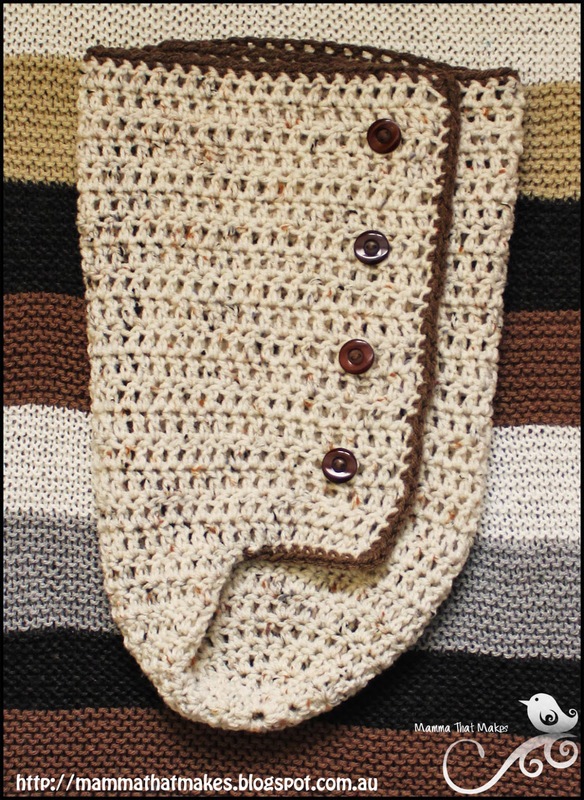 If you pick the right button size, the button will fit between any double crochets in the row. 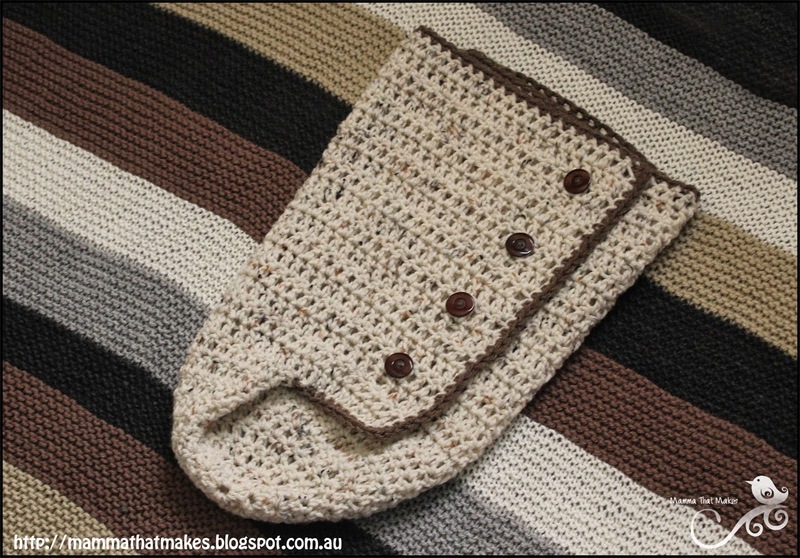 This is useful then because you can adjust the size (circumfrence) of the cocoon as the baby grows. Hi, do you have the dimensions on this? I want to do hdc to make it less "holey". What do you mean by join? Is there a video on YouTube for this? Pattern looks great... looking forward to doing it. For each row from row 10 to row 26- at the end of row 9 Ch3, turn, double crochet in each dc across. Repeat for each row until you have completed 26 rows. At the end of row 26, tie off your main color of yarn. join your contrasting color of yarn and single crochet across, then sc evenly down the opening and back up the other side.